On March 18 (Sun. 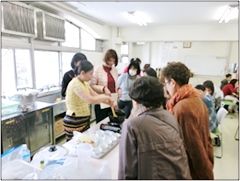 ), 2018, the city held Shinjuku City Multicultural Exchange “Myanmar Culture Class” at Nishi-Toyama Lifelong Learning Hall. 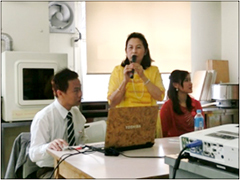 We invited speakers from Myanmar to enlighten Japanese and non-Japanese residents about the country’s culture. They used video footage of local scenes during their talks, showing us things we would rarely see or hear about in our everyday lives. Although we were surprised by the differences between the Myanmarese and Japanese cultures, the friendly exchange gathering gave everyone an opportunity to get to know one another. Many people came, so we were able to hold the class in a lively and cheerful atmosphere. There are 135 ethnic groups in Myanmar, and they wear different styles in each region. The vast variety is evident when they hold fashion shows. Some styles have sparkles, some are embroidered, and they are all gorgeous and impressive. Yangon, Bagan, Mandalay and Inlay were mentioned as popular sightseeing spots in Myanmar. There were many questions about Myanmar during the Q&A session, and the audience listened with deep interest to the presenters’ answers. When asked about the education system, the differences between the systems in Japan and Myanmar were surprising. Participants found out that elementary school begins at around five years of age in Myanmar and lasts for five years, while junior high school lasts for four years and high school is just two. Myanmarese cuisine uses minimal spices and a lot of oil. Since Myanmar shares a border with many countries—including China, India, Thailand and Bangladesh—each of these countries influences the dishes made here to create a diverse food culture, which is another unusual characteristic of Myanmar. 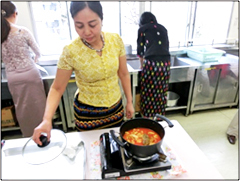 We ate Myanmarese chicken curry during the afternoon culture class that was prepared by a chef running a Myanmarese shop in Takadanobaba. 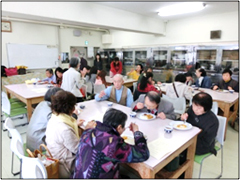 While sampling the country’s food culture, participants enjoyed friendly conversation. People who were eating Myanmarese curry for the first time were enchanted by its taste, and they asked the chef for the recipe and for hints about how to prepare the dish. The room was buzzing with excitement. The chef demonstrated how to prepare the dish and explained each step very carefully. After the meal we drank delicious Myanmarese tea, which reportedly helps dissolve fat.